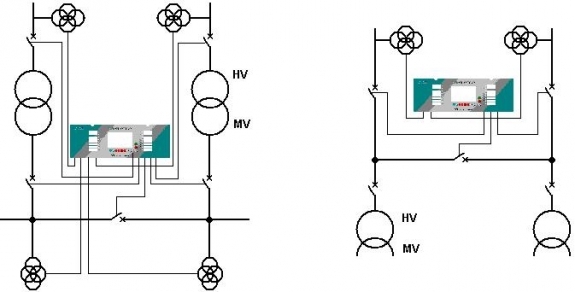 UTXvSZR is a comprehensive solution for HV and MV feeding Power Transformer/Bay switching. It provides fast and reliable Automatic Load Switching (ALS) due to either the power lack or feeding Bay Circuit Breaker tripping. Reliable operation of the device is based on precise and quick analog value measurements and precise voltage vectors finding. UTXvSZR is equipped with: 14 Bit A/C converters, serial transmission interfaces (RS 232 – supervising channel and RS 485 – using IEC 870-5-103 standard protocol), with optional optical fibre and/or network communication – TCP/IP. Applied at MV substation, UTXvSZR is able to operate and monitor 3 or up to 5 CBs. Installed at HV substation, the device is able to operate and monitor 3 CBs (two CBs of the lines and one of the line coupler). Except the standard ALS modes, UTXvSZR can provide any user with a defined switching scheme, comprising up to 8 voltage groups and 15 CBs. Up to 10 starting conditions (determining CBs status, voltage stages, Power Transformer tap controllers statuses) for each of 8 operating modes. Possibility of cooperation with Automatic Over Ethernet (AoE) systems and with Alice`79 system.